Can grow up to 6 ft. in a single year and fruit in 3-6 years from seed. Like butternut clusters of nuts form up and down the branches in great profusion. The original parent tree that we used to create our seed trees yielded over 25 bushels of nuts one year. Buartnuts are big spreading trees with trunks reaching up to 4 ft. in diameter with a 90 ft.crown. 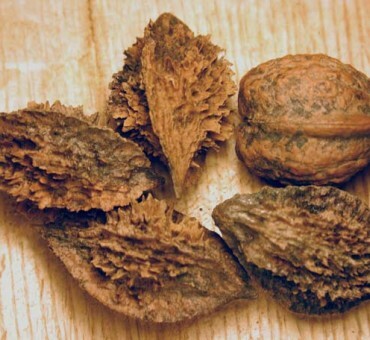 Although thick shelled the nuts are not at difficult to extract as black walnut once dried down a bit. This takes about a month at room temperature. 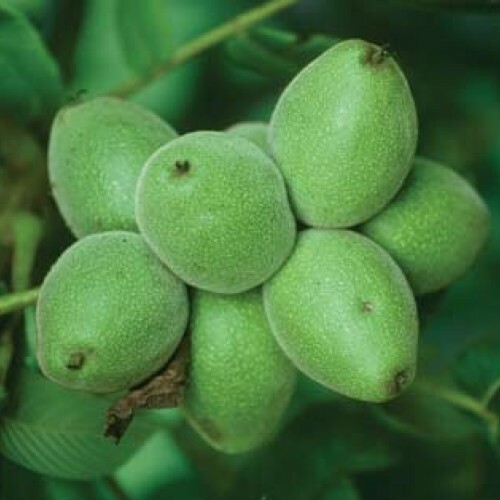 We have many different types of buartnuts at our farm and this one is the most consistant in bearing and appears quasi resistant to curculio which greatly lowers the crop in the other walnuts. The leaves also do not get anthracnose which causes many walnuts to defoliate by August. We believe this to be a hybrid with English walnut and butternut or another mixed hybrid. Our seed orchard contains a very beautiful mix of these fast growing hybrids. Best if two plants but is self fertile. Sandy and sandy loam. Can tolerate clay. The easiest walnut to grow and fruit.